The Directory of Open Access Books (DOAB) is a service of OAPEN Foundation and operates as a discovery service for open access books. DOAB launched in 2015 and currently has 4035 Academic peer-reviewed books from 135 publishers. In 2015, DOAB won the IFLA/Brill Open Access Award. This award was created in 2013 to recognise initiatives in open access monograph publishing and in 2015 DOAB was recognised as the most outstanding and game changing initiative in this field. Research has shown that OA books listed in DOAB receive almost twice as many downloads as unlisted books. You can search and browse to discover content. You can browse by title, subject or publisher. You can search across a range of fields including: title, ISSN/ISBN, publisher, author, keywords and abstract. You can also limit your search by publication year. Brief bibliographic information is provided plus links through to the open access books on publisher websites. Licence information is also clearly flagged for each item as in the example shown below. This entry was posted in Ebooks, Open Access on 20th Jan, 2016 by Lee Snook. OpenStax College is a nonprofit organization committed to improving student access to quality learning materials. 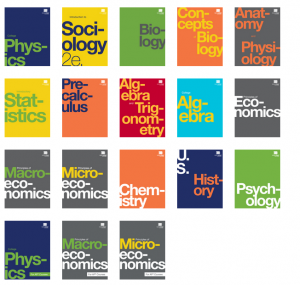 It offers professional-quality textbooks that are free online and low-cost in print in a range of areas. The content is aimed at supporting introductory US College courses, but could be useful for introductory undergraduate modules studied in the UK. The books are also customisable so can incorporated into modules by lecturers – at chapter or book level. Or students can use these as free additional materials to support their recommended reading. OpenStax College textbooks are licensed using a Creative Commons Attribution license (CC-BY 3.0). This license lets others distribute, remix, tweak, and build upon our works, even commercially, as long as they credit the authors for the original creation. For more information, take a look at the OpenStax College website. This entry was posted in E-Resources, Open Access on 1st Sep, 2015 by Lee Snook. The Digitization Projects Registry is a listing of digitization projects undertaken by libraries, U.S. Government agencies, and non-profit institutions with a goal to increase access to historical U.S. Government publications that were previously only available in print format. As well as listing key information about each project, a link is included to the digitized content, making access to this information possible to a much wider audience. A selection of links to some of the projects in the Registry are listed below, to give you a flavour of the kind of content you can discover. This entry was posted in E-Resources, Open Access, Research on 17th Jul, 2015 by Lee Snook. Find that research paper (and more!) on Open Research Exeter! Have you browsed through Open Research Exeter (ORE) recently? Why not have a look? The university’s online repository showcases all types of Exeter’s research, including research papers, research data and theses. Research in ORE can be viewed and downloaded freely by researchers and students all over the world. If you need a full-text copy of a research paper or PhD thesis by a UoE researcher, this is the place to look! Elena Isayev and Catrin Webster, 1000 Colours Blue – A Sample of Blues Images. This is a small sample of the 1049 ‘1000 Colours Blue’ images that were painted on canvas by school pupils during workshops conducted as part of the AHRC-funded ‘Future Memory in Place‘ project. Each pupil attempted to replicate a shade of blue from the Swansea waterfront. For more information about how to put your own research outputs into ORE see our Open Access pages. This entry was posted in Open Access, Research on 24th Jun, 2013 by Hannah Lloyd-Jones. Open Research Exeter (ORE) launch! Are you thinking about uploading a copy of your research paper or your PGR thesis to the University’s repository? Well, you might like to know that ERIC, the current institutional repository, is being rebranded this week as Open Research Exeter (ORE)! ORE showcases all types of Exeter’s research, including research papers, research data and theses, increasing its visibility and impact. Research in ORE can be viewed and downloaded freely by researchers and students all over the world. Research in ORE is securely stored, managed and preserved to ensure free, permanent access. ORE’s content includes journal articles, conference papers, working papers, reports, book chapters, videos, audio, images, multimedia research project outputs, raw data and analysed data. This entry was posted in Open Access, Research, Research Commons on 19th Mar, 2013 by Hannah Lloyd-Jones. The Open Access Research and Research Data Management Policy for PGR Students has now been approved by the Board of the Faculty of Graduate Research. This entry was posted in Open Access, Research and tagged Open Access, PGRs, policy, research data management on 25th Feb, 2013 by Hannah Lloyd-Jones. Click the request button. You will first be asked to log in with your university username and password (or if you are an external borrower, Exeter alumni, fee payer or SCONUL access member you will need to tick the ‘Login using UoE Library identification UniCard or Library Card instead’ box and log-in using your barcode number and Library PIN). Click on ‘Request Selected item.’ You should then be taken to screen that will confirm your hold has been successfully placed. Don’t forget to log out of your Library record! If the item you requested was due back more than a week ahead the loan period will be automatically shortened and the current borrower will receive an email asking them to return it by the new date. When the item comes back you will receive an email from us and you can come in and collect it from the home library of the book, e.g. if it is a book from a collection in St Luke’s you will need to collect it from there. 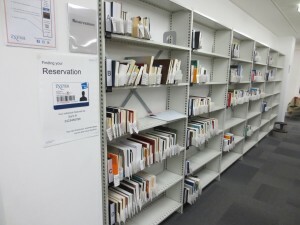 Forum Library books should be collected from the reservations shelf in Express Collections. Find your item on this shelf: it will be filed under the first four letters of your surname and your library card number. Issue the item as normal on one of the machines in this section. We hold the item here for up to one week (or until your not ‘cancel by’ date is reached, whichever is sooner) after this time it will pass to the next person in the queue, or back into circulation if nobody else is waiting. You can place up to 10 holds at a time and don’t forget you can always cancel holds you no longer require, or check which items you are waiting for, by logging in to your patron record. 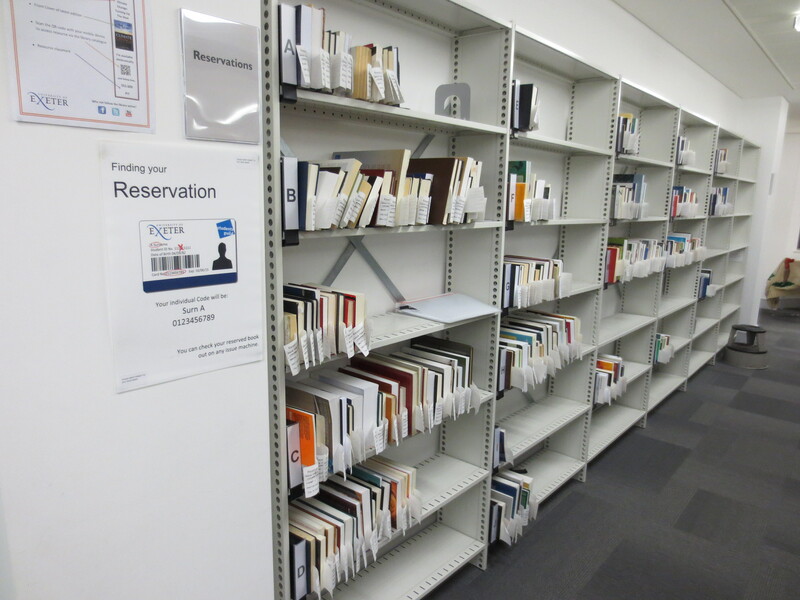 Please note you will not be able to request books that are freely available on the shelves, just come in and get them. If you have any questions or would like help with this topic please contact Library Staff. This entry was posted in Open Access, Using the Library and tagged access to resources, how to guides on 17th Feb, 2013 by reg206. We are delighted to announce our programme of events to celebrate International Open Access Week from 22nd to 26th October 2012 which will take place on Streatham, St Luke’s and Tremough campuses. Open Access to research publications and data has the potential to transform the way research is conducted and Open Access Week is a key opportunity for all members of the community to better understand and become more involved in this international movement. We have organised an exciting week of activities which include our keynote speakers, Cameron Neylon, Advocacy Director at Public Library of Science, who will talk on How I learnt to stop worrying and love the RCUK policy, and Alma Swan, Director of European Advocacy for SPARC, who will present on Open Access and You – A relationship with promise. Other events include a webinar on Managing Research Data for the Social Sciences, Brian Kelly’s presentation on Open Practices for the Connected Researcher, Mark Hahnel’s talk on the Disruptive Dissemination of Research Outputs, a special Open Access edition of Research Speed Updating and a workshop on Data Protection, Data Storage and Sharing. Come along to our Open Access Café, where are Open Access Week competition will be announced, and chat to others about Open Access issues over a glass of wine at our Open Access Happy Hour. The full timetable of events is available here – we do hope you can make it to some of the activities or stop by at our stall on the mezzanine level of the Forum from Monday 22nd October! This entry was posted in Open Access, Research on 16th Oct, 2012 by Hannah Lloyd-Jones. Do you need to publish your paper on Open Access? We have a grant from the Wellcome Trust to pay for the costs of publishing papers arising from research funded by the Wellcome Trust on Open Access. If you have paid to publish Wellcome research on Open Access recently, or plan to, please let us know as we may be able either to fund or reimburse these costs. 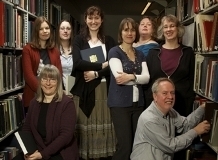 You can find out more about how the University is helping researchers meet funders’ Open Access policy requirements from the Library web site: http://as.exeter.ac.uk/library/resources/openaccess/ . We also have a subscription to BioMed Central (covering full costs of publication) and a smaller amount of money to cover the costs of publishing in other journals. The funds currently available are under review and we hope they will be increased in future to help a wider range of researchers to comply with funder policies. This entry was posted in Open Access, Research and tagged articles, BioMed Central, impact, Open Access, papers, Research, Wellcome Trust on 1st Aug, 2012 by Hannah Lloyd-Jones.